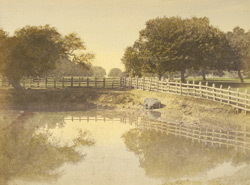 A Hand-coloured print of the Barakpur Park, from the Fiebig Collection: Views of Calcutta and Surrounding Districts, taken by Frederick Fiebig in 1851. This is a view in the menagerie at Barrackpore Park, with the rhinoceros asleep by the side of a pool. Marquess Wellesley was British Governor-General in Calcutta from 1797 to 1805, and converted the home of the commander-in-chief of the army at Barrackpore into a palatial summer residence in 1800. He had the gardens of Barrackpore Park laid out in the 'English Style' and the extensive grounds contained a theatre, an aviary and a menagerie. He supported the Indian Natural History Project (1801-1808), which aimed to inventory all the animal wealth in the massive country. The project ended prematurely but the animals in the menagerie were retained, and it was from this nucleus (maintained by successive governors-general) that the Zoological Gardens of Calcutta, in Alipur, developed.